With over 1.6 billion monthly active users, there is no doubt that Facebook is the place to be when it comes to looking for platforms to scale your growing business. But how can you leverage this dominant social media channel to make the most of your impressive business efforts? Here’s a list of seven apps that your company should consider if Facebook is a part of your growth strategy. While Facebook has been known to be a brands’ go-to marketing channel, oftentimes your actual customers can generate enough hype around a product to drive sales. Indeed, leveraging user-generated content (UGC) such as customer reviews or user-uploaded images on Facebook can help your business immensely. With Yotpo’s Dynamic Ads feature you can use tools to share customer reviews and photos organically, as well as incorporate them into paid ads — a tool so valuable, Facebook used it as a case study. Facebook dwarfs all other social channels when it comes to active users, content sharing and referred click-throughs to websites. But the average Facebook users don’t spend their time looking for business opportunities — they’re there to see amusing content and keep up with friends and loved ones. To effectively take advantage of Facebook’s immense marketing potential for business, therefore, companies need to keep their messaging light and fun. ViralStyle provides a solution for fan community monetization that takes the friction out of selling branded merchandise. This social ecommerce platform lets you offer t- shirts, hoodies, iPhone cases and other products with your own art, and because it’s all printed and shipped to order, there’s zero hassle for inventory or fulfillment. Using ViralStyle’s marketing tools, it’s easy to set up a “campaign,” which adds a ticker to product pages for a sense of purchase urgency. 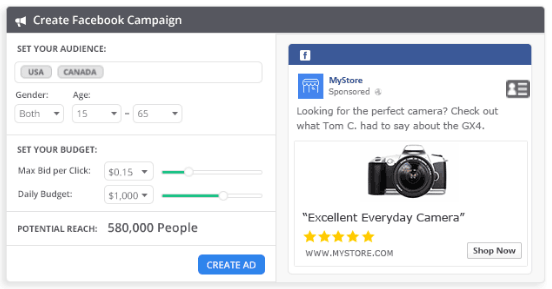 The platform also integrates with Facebook ads(soon with Shopify as well), to allow users to seamlessly promote creations to highly relevant and targeted buyers. Today, business owners and marketers are expected to always be reachable and ready to address customer inquiries. While this may seem overwhelming, there are great tools that help facilitate better and more frequent communication between prospective buyers and sellers. 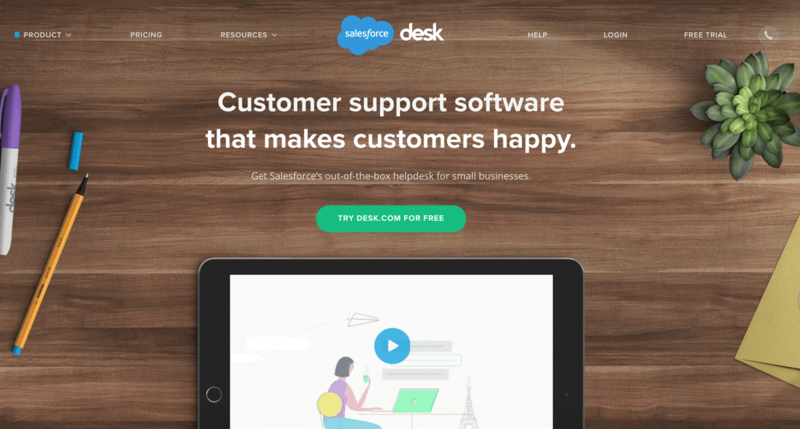 For instance, Desk.com integrates with Facebook as a highly-effective engagement feature that will help address immediate customer questions and concerns. I personally use them for my payments support and it’s helped us manage our thousands of customer tickets each month, a large portion of which comes through Facebook. With so many different marketing options on Facebook, sometimes it is difficult to get the most out of your campaigns. Thankfully, there are solutions such as GetResponse’s Facebook Web Form App that embeds sign-up forms on your Facebook company page. This allows prospective leads and/or interested page visitors to easily sign up for more information. For businesses, being able to stay ahead of all the marketing tasks can be daunting, especially when data plays a major role in your scaling efforts (as it should). Visuals can help make sense of this mess. Cyfe’s business dashboard, for example, displays various metrics that are often indicative of successful or poor marketing campaigns. With this information at hand, marketers can look to scale based on specific benchmarks. More specifically, you can track your entire social media and Facebook data, to instantly assess your overall campaign performance, cost, CTR, impressions and more. For ecommerce businesses, Facebook is often considered a second priority to your company’s online store. Being in the payments space, I’ve found that most business owners don’t even consider Facebook for ecommerce. Having just discussed the dominance of Facebook usage, you may need to reevaluate your relationship with this outlet. The Shopial app is a timely one for ecommerce, as it essentially acts as a bridge between the store’s website and Facebook store, allowing you to easily add and advertise specific products to boost engagement and eventual conversion levels. On Facebook, B2C engagement outshines B2B prospecting, but savvy business leaders know how to use the ubiquity of Facebook to their advantage. In the B2B space, the journey from curious website visitor to converted customer is complex and rarely predictable. As buyers transition from sales-driven product education to self-service content discovery and become more guarded with their contact details, it isn’t always possible to capture email addresses and use prospects’ inboxes as hubs for lead nurture messaging. Today’s B2B marketers therefore employ a litany of tactics to track prospects across devices and marketing channels, engaging with potentially interested parties wherever possible. With Leadfeeder, you can circumvent the need for lead capture and instead see a dynamic list of anonymous visitors to your website, along with intelligence on the companies they work for and logs of pages they click on. Now here’s where it gets interesting. Because the system integrates with your customer relationship management (CRM) and you can use it to export segmented lists of contacts, the B2B growth hackers out there can easily use Leadfeeder as en engine for creating hyper-targeted “Custom Audience” ads on Facebook. @PaulNicholsonGo That's was a lot of bots following you! @sparrow_crm @xtracuts Sure @sparrow_crm How about Friday morning around 10 am? We can do a skype call. DM me your skypeid and I will ping you on skype. @sparrow_crm @xtracuts Thank you @sparrow_crm If you need any help implementing this at your customers CRM, please let us know and we are all ears!